Andy Murray will aim to continue his charge towards a third Wimbledon final against Jo-Wilfried Tsonga on Wednesday afternoon, in a re-run of the 2012 semifinal. Find here our Tsonga v Murray betting preview, with free tips, predictions, best odds, bookie offers and no deposit free bets on Wimbledon. Jo-Wilfried Tsonga is coming off a victory over Richard Gasquet in which he was forced to retire in the first set. The 12th-ranked Frenchman eased past Inigo Cervantes and Juan Monaco before saving one match point to outlast John Isner 6-7(3), 3-6, 7-6(5), 6-2, 19-17 in the third round. He has won no fewer than 81 percent of his first serve points. Andy Murray has been blowing his competition to pieces as he has yet to lose a set thus far in the tournament. In the first round he brushed aside a young Liam Broady (6-2 6-3 6-4). Lu Yen-hsun was Murray’s victim in the second round (6-3 6-2 6-1), John Millman his opponent in the third round (6-3 7-5 6-2). Finally, the Scot faced Nick Kyrgios was in the fourth round. The Aussie struggled to find his natural game and was dumped out in straight sets (7-5 6-1 6-4). In that victory, n the victory, Murray won 41 of 49 of his first serve points and racked up 36 winners and six unforced errors. Murray and Tsonga will be meeting for the 15th time in their career. The two-time Grand Slam winner lead the Frenchman 12-2, including 5-0 on grass and 2-0 at the All-England Club. They have not clashed since a pair of encounters last summer, when Murray prevailed 7-5, 7-6(10), 6-2 in a Davis Cup showdown on the grass courts of Queen’s Club and 6-4, 6-4 at the Montreal Masters. Enhanced price! 3/1 Andy Murray to beat Jo-Wilfried Tsonga! Crazy boost! 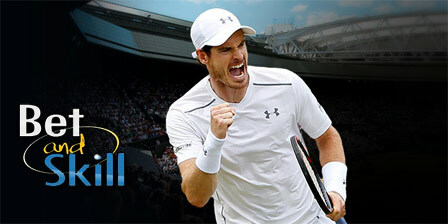 7/1 Murray to win Wimbledon + £100 bonus! Price boost! Murray 7/1 to win Wimbledon + £5 bonus! "Tsonga v Murray predictions, tips, odds and free bets (Wimbledon - July 6, 2016)"